With twitter, television and print media cranking out only what is wrong with the world it can be hard not to become obsessed with watching the stocks and bonds gyrations in your portfolio. It is also tempting to think you can outperform everyone else if you can just time it right, listen closely, or worse, go to cash until things calm down. The reality is, most of what is reported by the media is really a lot of noise. The daily ups and downs have always been part of the market. To succeed you have to constantly remind yourself that you are not investing for one day, or one week or one month. 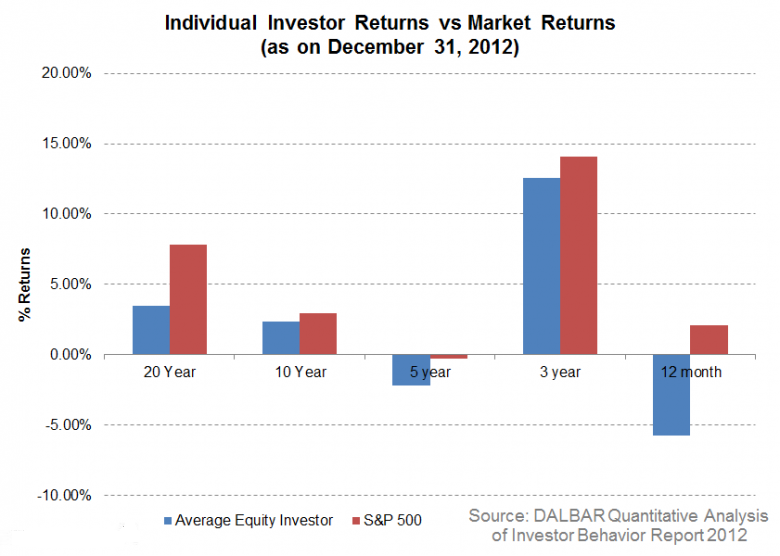 Long term investing will help you realize goals that are years, if not decades, down the road. When you get too involved in how the markets will react to what’s going on in Palestine, Iraq, Russia or the latest news from CNBC, it will distract you from your life goals—such as saving for your kids’ college fund or planning for retirement. It is precisely for these reasons that individual investors have historically underperformed their professional counterparts in dramatic fashion. (See Graph below). In short, don’t do it alone…seek a professional investment adviser, preferably one that will keep you from deviating from your long term investment objectives. This is the most common question we get asked. It is a valid question given the 6-year bull market we have experienced since the last recession in years of 2008-2009. What we at QCI like to point out about the health of the stock market is that the economy continues to gain traction quarter after quarter while earnings on the S&P 500 companies have continued to improve. Skeptics have expressed concerns about whether the rally has pushed stocks into overvalued territory and that the market is potentially vulnerable to a decline. We believe there is no cause for alarm just yet. 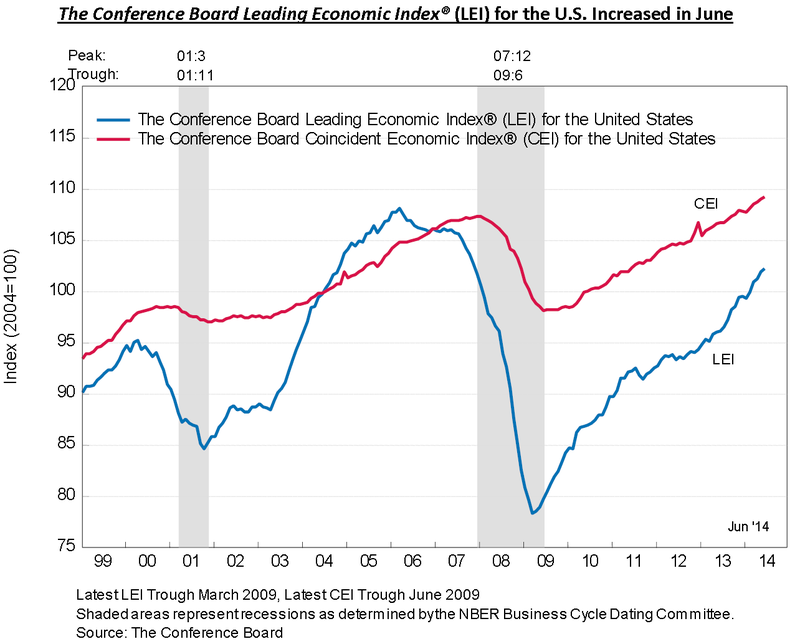 The data (See graph below) shows the real economy is starting to improve, which is clearly reflected in the Conference Board of Leading Economic Indicators (LEIs) we follow. These indicators cover a wide range of forward-looking data related to manufacturing, housing, services and more. Eight components are positive and two are down (mostly due to regional weather-related effects… what meteorologists called the Polar Vortex). The stock market has also responded positively to the government announcement that the economy had added 288,000 jobs in June—more than analysts had expected. Stronger corporate profits have helped sustain the rally as well. The stock market Price to Earnings ratio of the companies in the S&P 500 is at 18 times the 2014 profits. This isn’t particularly high by historical standards. Valuations aren’t extreme by any means but are hovering very near historical averages. However, there are pockets of the stock market that are indeed overvalued such as the internet stocks and biotechnology stocks. Most of these companies do not pay dividends and 75% of them are trading at a prices over 25 times earnings, which is much higher than the S&Ps Price to earnings multiple of 18. At QCI, we focus on value stocks that also pay the investor dividends to hold them. It is important to understand that over 43% of the stock market’s historical returns comes from dividends. Thus, it is crucial that your long-term portfolio is diversified with dividend paying stocks. As the domestic energy sector expands and more jobs are created, we will eventually begin to realize wage inflation. The United States is going through a great change, a renaissance of sorts, from a large energy importer to a net energy producer and eventually…net exporter. New energy extraction technologies, discoveries, coupled with the natural gas and shale boom are allowing American companies to benefit from lower transportation, energy, and manufacturing costs. This is also benefiting US industrial services as they become more globally competitive. Hundreds of thousands of jobs are being created as a result of this tremendous economic resource shift. This economic shift will produce higher wages for both unskilled and skilled workers. One of the major effects wage inflation has on other sectors of the economy is that it creates new home buyers. 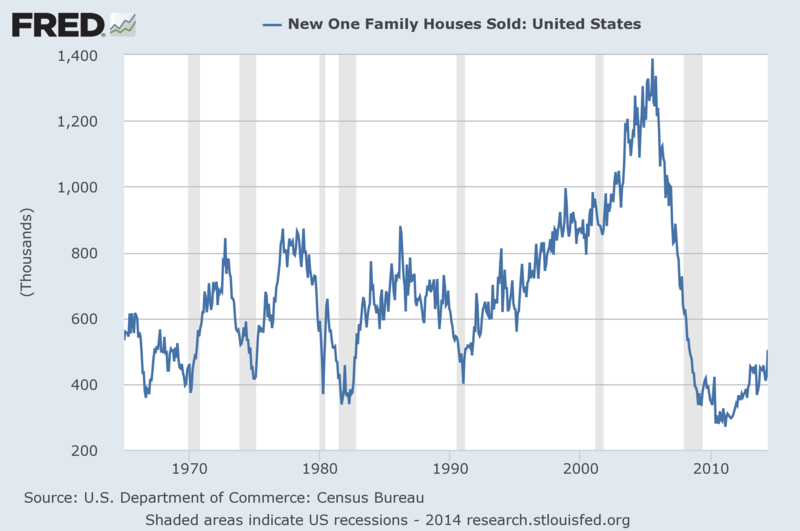 In a market where new home building has been depressed for some time, the demand side will soon outstrip supply. We feel there is long-term pent up demand in the home-builder space thus the REIT (Real Estate Investment Trust) and home-builder sectors look promising. However, it is important to know that not all REITs and homebuilders are worthy. Seek professional guidance before investing in these complicated asset classes. We also believe there is a tremendous need for energy transportation infrastructure development. The existing railways and energy pipelines are not capable of transporting the full capacity of the new existing output of oil and natural gas currently being extracted and much less the larger amounts coming online in 2016 and beyond. We feel that there are several key companies that will benefit from these demand drivers and we have begun to invest accordingly. To summarize, the long term picture of the economy is on solid footing. However, diversification is key to long term success. If you have any questions about this report our would like to know more about QCI and our financial planning and investment services feel free to contact us any time.